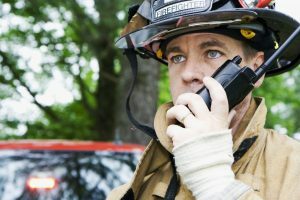 First responders need to communicate no matter where emergency strikes – from the concrete and steel high-rises of the cities to the hills and valleys of rural areas. In the years since 9-11, a slew of new regulations have been enacted in local municipalities and states to make sure fire and police personnel have reliable communications to do their jobs. Mann Wireless is one of the nation’s most experienced providers of custom solutions for complete, seamless coverage for your public safety radio system. Make Mann Wireless your first call to ensure permitting and regulatory compliance. Both NFPA 72 and IFC 510 have outlined requirements that buildings need to meet with regards to public safety radio coverage. These codes require all buildings to meet a minimum signal strength for public safety radio services throughout, allowing communication between emergency responders and their respective bases. Any building not meeting the minimum signal strength requirement for the respective codes must be equipped with a system that will allow compliance. NFPA 72 and IFC 510 are model codes designed to safeguard the public, and it is important to check with your local authority having jurisdiction (AHJ) to see what code is being enforced in your municipality. For more information, review the NFPA 72 and IFC 510 fire codes. New Jersey – IFC 2015 statewide Uniform Construction Code adopted by regulation. Administered by the Department of Community Affairs (DCA). Uniform statewide and local jurisdictions are not permitted to amend. Virginia – IFC 2012 statewide, promulgated and adopted by the Virginia Department of Housing and Community Development (DHCD). The State Fire Marshall within the DHCD is responsible for statewide implementation of the Fire Code, unless localities elect to adopt. Implementation for state colleges and universities is the responsibility of the Virginia General Services Department. Mann Wireless is one of the nation’s most experienced providers of custom solutions for complete, seamless coverage of public safety radio systems. We have deployed IFC 510 and NFPA 72 compliant public safety in-building radio systems in the following bands: VHF, UHF, 700 MHz and 800 MHz. Make Mann Wireless your first call to ensure permitting and regulatory compliance. We design, install and service in-building wireless solutions for distributed antenna systems, single and multicarrier systems, radio frequency systems and public safety systems. We work with public safety officials, building owners, businesses and wireless carriers to help create seamless in-building wireless solutions for cellular 3G/4G (LTE) and private land-mobile radio (LMR).